THE WORD ‘LORE’ IS BEST DESCRIBED AS TRADITIONS PASSED FROM PERSON TO PERSON. OBVIOUSLY, FOR THESE LESSONS TO BE CONTINUED, A SERIES OF RELATIONSHIPS BETWEEN EACH MEMBER MUST BE CREATED. 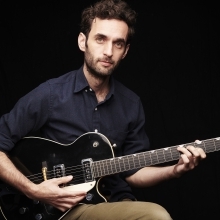 GUITARIST JULIAN LAGE HAS SPENT THE GREATER PART OF HIS CAREER FOCUSING ON DEEP ROOTED RELATIONSHIPS WITH ARTISTS IN ORDER TO CREATE A PERSONAL BODY OF WORK. EACH OF HIS ALBUMS HAS A DIFFERENT FEEL, RANGING FROM SWINGING JAZZ TO ROCKING ELECTRIC TO BOHEMIAN SWING TO EVEN CUMBERLAND GAP FOLK AND TRADITIONAL. THE SIZE OF THE MUSICAL ENCOUNTERS HAVE RANGED FORM INTIMATE DUETS TO CASUAL MID SIZED GROUPS. WE RECENTLY HAD A CHANCE TO PICK JULIAN LAGE’S BRAIN AND GET A HANDLE ON HIS MUSICAL WORLDVIEW, AS WELL AS HIS MUSICAL WORLD. WHEN YOU WERE A 10 YEAR OLD, THEY DID A DOCUMENTARY ON YOU IN WHICH THEY LABELED YOU A “PRODIGY.” IN RETROSPECT, WHAT ARE YOUR REFLECTIONS OF THAT; WAS IT A BENEFIT OR A MILLSTONE? When I was young, I played music with my father. He played guitar and started kind of around the same time that I did. He started, and I wanted to do something with him. So, for me, playing guitar was a very familial thing; it wasn’t a thing that was designed for the public. The time I was growing up was fortunately before Youtube and a lot of exploitative outlets. But still, word would get around, “there’s this kid and he plays guitar” and that name of “prodigy” kind of came up. But, I associate it with my parents’ outlook on everything, which I admire so much. It became very clear that the word “prodigy” said more about the people saying it than about me. I think it was kind of a protective thing that I had to come to terms with very quickly. It wasn’t important for me to think it was freakish or unusual that I was doing something with music, because I knew I wasn’t that good! I knew of the masters like Jim Hall, Django or Pat Metheny. The bar is very high, so when I hear people talking that way I would think “why do they need me to be a prodigy in their eyes?” For some reason it had to be part of their narrative, and that’s ok.
IT’S INTERESTING THAT YOU BROUGHT UP ARTISTS LIKE HALL, REINHARDT AND METHENY. ALL THREE OF THEM, AND MOST GUITARISTS, MAKE THEIR NAME AND STYLE IN THE EARLY PART OF THEIR CAREERS IN A GROUP SETTING, AND THEN SPEND THEIR LATER YEARS JOINGING OTHER ARTISTS IN SUMMMITS. YOU ESCHEWED THE SMALL GROUP SCENARIO AND HAVE CONCENTRATED ON PROJECTS WITH OTHE ARTISTS, USUALLY IN A DUET SETTING, ALMOST THE REVERSE OF DIRECTION. WHAT WAS THE REASONING IN THAT DECISION? It’s funny that you say that, because I think about it a lot. My outlook on it tends to be relationship based. What I mean by that is that I feel so lucky to have genuine friendships with these people that I’m working with, and the projects we develop grow out of that. No, it’s that I love these people, and I’d be remiss if we didn’t do a project together. So, simultaneously, there is that effort to build somewhat of a foundation as either a bandleader or a solo artist. So, when you go out and do projects, it eventually leads people to things that you’ve done under your own name as a solo musician. My experience has been that it’s best not pick one over the other, but just do it all, throw it against the wall and see what sticks! There’s a humbling balance that comes from being in my own bubble. I count on it. EACH TIME YOU’VE PLAYED IN LA HAS BEEN DIFFERENT; YOU HAD YOUR OWN LATIN BOHEMIAN ACOUSTIC BAND, THEN AN ELECTRIC GUITAR ROCK TRIO, A SERIES OF DUETS WITH KLINE, ETC. AND A GUITAR QUARTET WITH ANTHONY WILSON. ARE YOU A RESTLESS SPIRIT, OR IS THIS A WAY OF DEVELOPING YOUR OWN TRADEMARK SOUND? If you stand back and squint your eyes to look back at the projects, they actually do add up to a kind of a focus. If you look at the Nels world, the bluegrass world, the various world music influences and the jazz and electric trio, it’s under this umbrella of “American Guitar.” In and of itself, it’s a very diverse medium, and that’s one of the things I come back to as the grounding agent. I think what the public sees is a commitment to one realm as well as being a part of other communities, which I love. WHEN YOU HAVE THESE GIGS WITH HERSCH, CLINE OR ELDRIDGE, ARE THEY SPONTANEOUS GET TOGETHERS, OR IS THERE A LOT OF PREPARATION INVOLVED? The agents do their job, and before you know it, it’s the summer of next year, and you’re on tour with the project that you almost forgot about. It’s a little unglamorous. It’s like “We oughta do something, but I’m on tour for six months. I have 3 days in August. OK! “ Then the agents do their thing, and you have to write music and you have to get your act together. How does what I’m doing benefit the people around me? Not in an altruistic way; not in a martyrdom kind of way. But, if you look back in history, that’s how we contextualize history. IT’S ONE THING TO GET IT TOGETHER, BUT DO YOU HAVE TO CONCEPTUALLY THINK DIFFERENTLY IN SUCH VARIED SETTINGS FROM METAL TO BLUEGRASS? DO YOU CHANGE YOUR MUSICAL DNA, OR JUST FIGURE OUT WHERE YOU FIT IN? Great question. It’s kind of both of those. It’s not a science at all; at least not yet. Ironically, I don’t change all that much, except for maybe the actual instrument that I’ll play. The repertoire is obviously different. But if I don’t change that much, everything else changes, and that’s what makes it sound like I’m playing differently. That’s the kind of thing that you see with people who make collaborations a priority, such as (Fred) Hersch (John) Zorn or (Bill) Frisell. You change the context; you don’t change, and it’s very liberating. Conversely or ironically, if you do only one thing, you end up re-inventing yourself a lot because you want to keep it interesting. YOU ALSO SEEM TO VEER TOWARDS THE ACOUSTIC JAZZ GUITAR, WHICH WAS THE ORIGINAL IDEA IN JAZZ UNTIL THE 30s WHEN THEY STARTED PLUGGING IN AND BECAME THE MAJOR GUITAR VOICE. ARE YOU TRING TO “BRING IT BACK” OR SIMPLY WHAT YOUR MORE COMFORTABLE WITH? It’s more the latter. I’m not an advocate for returning to anything. In many ways the electric guitar was a great thing for jazz, because we’re talking coming from the teens and 20s where the big inventions were the banjo and Hawaiian steel guitar. There was some acoustic steel string guitar and Spanish guitar in the 30s with guys like Eddie Lang or Nick Lucas at the forefront. It was great, but it was challenging. You had to play very hard just to be heard. Its timbre fit into a certain spot and not much else. I feel that the Hawaiian steel guitar mixed with that soaring, lyrical thing, mixed with that percussive thing with the banjo added and turned into the vocabulary that became the root of electric guitar as we associate it with jazz guitar with guys like George Barnes and Charlie Christian. You could now be percussive and syncopated, but you could also now be lyrical. At the turn of the new century, we’re looking back and there are things that we’ve kind of moved away from, in regards to acoustic jazz guitar of which I’m a fan. Volume, for one; guitars have gotten very loud and very big sounding. At the end of the day I do appreciate the qualities of the guitar back then when they actually still weren’t hyped and massive. The guitar was still an instrument that you played in your living room. YOU DID AN INTERESTING PROJECT, GLADWELL. WHAT ARE YOUR THOUGHTS ON IT IN RETROSPECT? So the philosophy was to put it all together relatively quickly based just on instincts. No traditional drums, cello would be beautiful, and do this with the arranging, etc. We then toured for a couple of years. We played and we practiced, and Gladwell was a record that was basically the outcome of what we were doing live. But the funny thing about it was that it wasn’t clear how we could translate it into a record. So, we started putting music together and writing songs and developed this narrative that helped us make sense in the modern jazz climate that we were in. We weren’t playing tunes; if we couldn’t write it we didn’t play it. It was a chamber group with strictly composed forms. It was just the nature of having classical musicians and jazz musicians together. Gladwell’s narrative was just that we were going to basically be “tour guides” and show various orchestral corners of our world that at that point were becoming pretty normal to ourselves. That was the basis; a total concept record from beginning to end. It was meant to present an otherwise working band. That band was really challenging in a lot of ways, because it wasn’t low hanging fruit. It wasn’t like “Oh, I can play guitar with them.” I felt that in so many ways I was the least appropriate instrument in that band, probably because of the frequency ranged that it occupied. I used it as a catalyst because I love the idea of an agile band where I can just show up with an electric guitar, play and put to use the training I had grown up with as a jazz guitar player. That band had more music in it, and I feel that if I had more time I could devote more time to just writing for it. So, Gladwell was like the final effort before I changed my mind and started paring down to playing with one other person at a time. I grew up with Dayna, Ambrose (Akinmusire) and Taylor Eigsti. We were kind of a group, of which I was the youngest. That was the community I grew up with; it all gets back to that thing that I said before. If it involves the people that I care about, I’m a big fan of investing in it. It’s a modern day attitude, but who knows, maybe it’s as old as time. I think that there’s a lot of pressure for people to pick their lane and stay in it. The irony of that is that our community is already so small to begin with, and if I’m being objective there’s a handful of people that I’m lucky to keep running into throughout my life since I was eight years old. I feel that regardless of trends or how the media handles jazz or regardless of cd sales, at the end of the day you have your neighbor. When I look to the people that I really admire like John Zorn, someone who’s built up a lifetime of music already, one of the traits that you see is that he’s a community leader. He wakes up, he creates music that creates opportunities for the people he cares about. They benefit; he benefits, and at the end of the day it’s all insular. He owns all of it and he’s in charge. That’s the question that I ask myself constantly. How does what I’m doing benefit the people around me? Not in an altruistic way; not in a martyrdom kind of way. But, if you look back in history, that’s how we contextualize history. We don’t just look at Bix Beiderbecke. We look at Bix Beiderbecke with Eddie Lang and Frankie Trumbauer and that community that was coming out of that part of Iowa. We look at Charlie Parker and see the Kansas City thing. With Charlie Christian we think “Wow, that was the Oklahoma sound with a real territorial community. Nowadays everything is so globalized in a way that it’s almost diffusing the reality. No; I’m going to work with people within a 60 mile radius! EXCELLENT! IS THERE ANY BOOK OR PHILOSOPHY THAT EQUIPS YOU FOR INSPIRATION TO THINK OR PLAY THIS WAY? Not just one book. I didn’t grow up in a religious household, although I am Jewish because of my mom’s side, as she’s Jewish. I’m always on a bit of a spiritual quest, so I’m always reading things from the Buddhist world, a lot of (Jiddu) Krishnamurti who’s a neat philosopher. Also Joseph Campbell; things by intelligent people. THAT QUEST FOR KNOWLEDGE COMES FROM THE JEWISH SIDE, AS EDUCATION IS BIG IN THE JEWISH CULTURE. But my background is a lot in something called Alexander Technique. (editor’s note; it’s a process to remove muscular tension by retraining physical movements and reactions) It’s been around for over 100 years; a lot of actors study it. It’s something I’m trained to be a teacher in. It took me four years of study and get all my hours in. I was going to teach it along with music, but now I just consider it for my own well being and entertainment, but within that technique there is a lot of discussion about how we think about ourselves, how we use ourselves in a very pragmatic way. But, I’d be remiss if I didn’t say that it occupied a spot of being an influential philosophy. WHAT FUTURE PROJECTS WITH FRIENDS DO YOU HAVE COMING UP IN THE NEIGHBORHOOD? There are some new records coming out, all in short order to be announced. This is kind of a global thing, but my dream is to continue to reconcile the acoustic and electric world under the guitar umbrella. At the end of the day, they are different instruments, and I play them differently. But I don’t feel that I’ve done my job to sew them into a fabric that covers everything I care about in a focused way. God willing, I have my work cut out for me. THE IDEA OF CREATING A COHESIVE LIST OF FRIEND/MUSICIANS IN WHICH TO EXPLORE NEW MUSICAL WORLDS IS BOTH REFRESHINGLY TRADITIONAL AND SIMULTANEOUSLY RADICAL IN THIS DAY OF RADICAL ISOLATION. 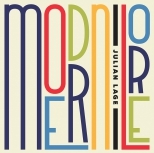 JULIAN LAGE HAS TAPPED ONTO AN IDEA AND PROCESS THAT HAS SERVED AS A TEMPLATE FOR NOT ONLY MUSICAL EXPLORATIONS, BUT INTERPERSONAL PEACE OF MIND AS WELL. CHECK OUT HIS LATEST ALBUM MODERN LORE, AND ENJOY THE COMPANY OF FRIENDS.